With the release of the iPhone 5S and with iPads slowly but surely invading the business world, it's time to look at apps that make these mobile devices even more powerful for business users. After all, you could argue that smartphones and tablets have already displaced desktops and laptops as the go-to devices for business. Of course, your organization may have anti-BYOD policies in place, which could slow down the inevitable, but even if they do, most of these apps will still help you be more productive, regardless of your employer's mobility policies. Cost: Pricing starts at $120/year, which also includes Silent Eyes, a tool to enable secure video chatting from desktops. Are you shocked by the NSA surveillance revelations? Do you think, "Hey, I'm not doing anything wrong, so this is a major invasion of my privacy"? If so, you might want to check out the Silent Phone and Silent Text apps, which securely encrypt calls, text messages and attachments against eavesdropping and monitoring. Silent Circle's technology encrypts calls and messages peer-to-peer, exclusively between users' devices, meaning there are no central encryption servers for attackers to target and compromise. With one Silent Circle subscription, you can activate the app on different devices including iPads, iPhones and desktops. Based on artificial intelligence, this app looks at calendar items, then searches for relevant data stored in other apps, including Exchange, Gmail, Word, PowerPoint, social networks, etc. If I had a meeting on my calendar, Tempo would search for related information and then bundle it within the event. It could pull in an email string, documents and location information. If I’m running late, one-touch buttons let me shoot off a quick, pre-populated email saying I'm on my way. If this were a conference call, the app would manage the dial-in info and passcodes. Since this is AI-based, the more you use it, the better it should get. Cost: Plans start at $25/month. SimpleCrew is a mobile photo app for business groups and teams. Think of it as a private version of Instagram. Businesses can use it to track work progress in the field, and can also view a photo timeline that shows ongoing progress, as well as who took each photo, when, and where. If you want to make photos public, a web uploader allows you to link work projects to social media, which is especially relevant for things like fundraising, marketing, and events. Cost: Pricing starts at $9.95/month for individual users. Family and corporate discounts are available. Available on Android too? Not yet, but soon. 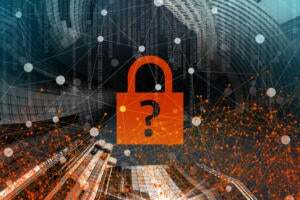 Most business travelers know that public Wi-Fi networks aren't safe, since most Wi-Fi signals are unencrypted, but many people still ignore that fact and use unencrypted Wi-Fi for important business, especially when a deadline is looming. With Private Wi-Fi, you essentially become invisible to would-be hackers. Private Wi-Fi encrypts all data going into and out of your device, acting like a personal VPN. Traffic is routed through Private Wi-Fi's secure servers. Private Wi-Fi also assigns you a temporary and random private IP address that cannot be traced through Private WiFi's servers, nor can anyone find your real IP address or location. Cost: Pricing starts at $39/month/user. 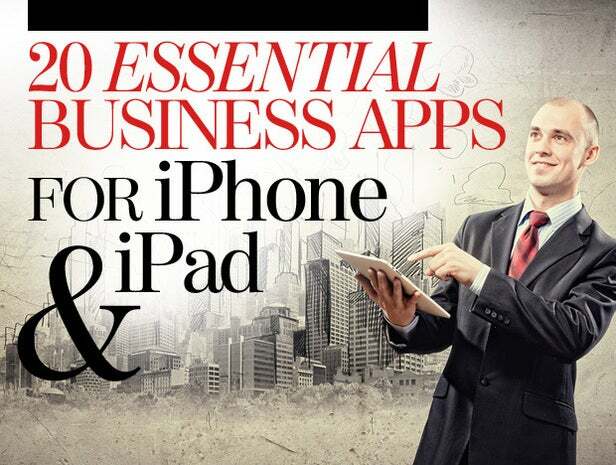 Roambi offers two business intelligence (BI) apps specifically designed for iOS mobile smartphones and tablets. Roambi Analytics is a BI tool that takes data from any source and transforms it into "views" to help you understand those numbers. Roambi Flow helps you tell the story the analytics reveal, creating multi-touch online documents that provide the context behind the numbers and tell the stories the numbers reveal. Onvelop is an iPad unified collaboration and communication app that gives you enterprise mobility and BYOD capabilities through secure access to Office 365, SharePoint and Lync. Using licensed Microsoft protocols to enable mobile access to enterprise server software, the app provides employees with the flexibility they need to work and communicate with their own iPhones and iPads. Are you worried that your competitors are beating you because they're more social media savvy, or they've jumped on some new social media platform that you don't even know about? 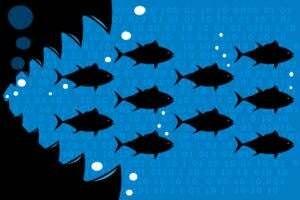 Perch is a sneaky competitive intelligence app that helps you monitor the social-media activity of your competitors, so you can trump them in real time. The app gathers the Facebook posts, Yelp reviews, tweets and Internet deals of other businesses and streams them to your phone. If you see a competitor offering a deal, you can counter with a deal of your own. FormMobi is a "virtual clipboard" that helps field professionals gather (and share) data on a mobile device. The app lets you record audio, take pictures, collect signatures and even create architectural sketches. You can create custom forms or rely on a library that includes forms for everything from real estate listings to construction site inspections to dairy barn feeding schedules. A cool feature is the ability to leverage GPS for all sorts of measurements, such as wooden fence estimates. Cost: Pricing for phone-based interpretation ranges from $1.00-$1.75/minute with premium add-ons available for industry expertise. Prices for document, audio and video translation range from $.09-$.14/word. 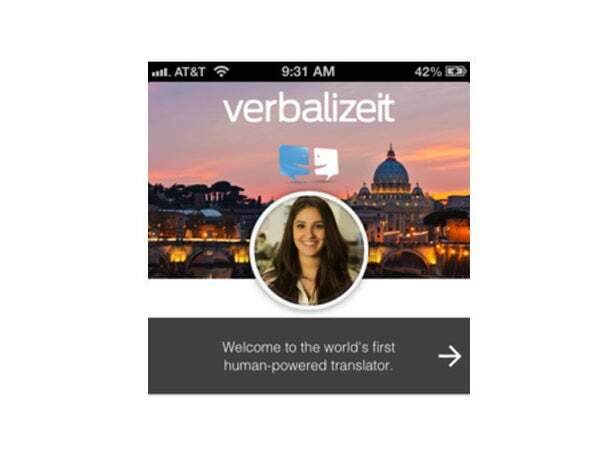 The VerbalizeIt app gives you access to a global community of 12,000+ human translators to ensure that language is never a barrier to business. The app supports international business travelers with on-demand, phone-based interpretation, and the company also offers a self-service enterprise platform for document, audio, and video translation. Cost: Free for the basic version. Loop Pro, which lets business users ask more questions, exercise more brand control, and collect more responses, is $19.99/month. Loop is a mobile app that helps you create simple surveys that you can share via email, web link and social networks. You can also use your iPad to create and conduct in-person surveys. 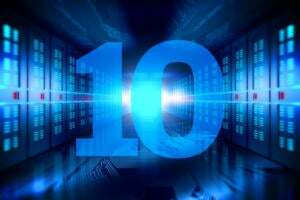 Cost: Free for 12 users and up to 5GB of online storage. Premium plans start at $99/month, supporting unlimited users, additional features, and 50GB of online storage. Bitrix24 is a cloud-based collaboration workspace that lets business users create a "social intranet" that helps workers collaborate on the many aspects of daily operations and tasks. It features an activity stream, video chat, "like" buttons so you can approve of various things coworkers have accomplished, and layered security. 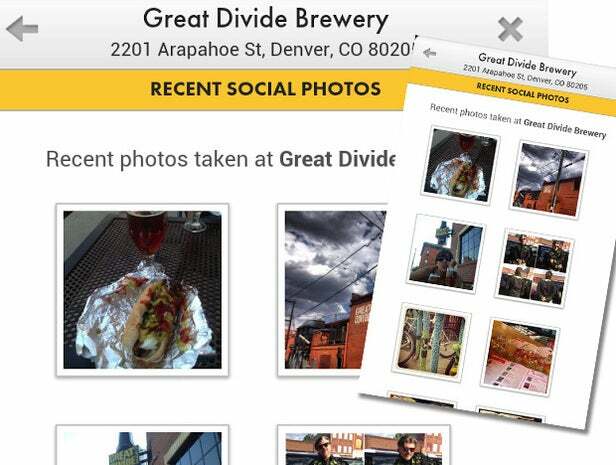 The mobile app allows you to manage all of this from your smartphone. Cost: Free for personal use (up to 5 users); business pricing starts at $12/month/user. Available on Android too? A beta version is available, but not all of the kinks have been worked out yet. 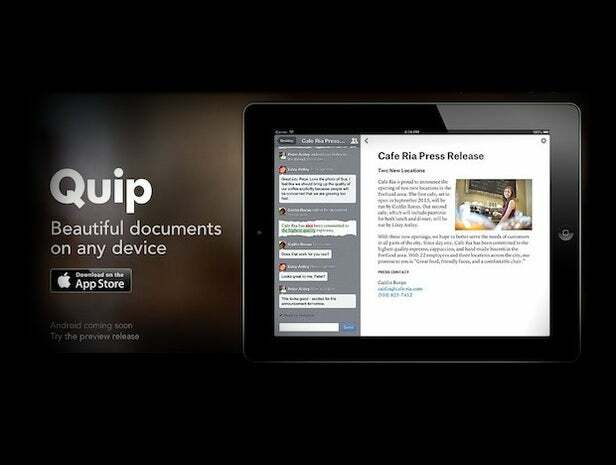 Quip is a word processor designed specifically for smartphones and tablet. There are all sorts of tools that help you compose, share and edit Word documents on your smartphone. I've tried several and have grown increasingly impatient with them. Quip rips up the old word processing paradigm and starts over with mobile devices guiding the design. It adapts to any screen size automatically (so no more pinch-zooming or side-scrolling), merges changes automatically if you've been editing offline, and enables fast collaboration through messaging and push notifications. Other features include the ability to turn a bulleted list into a to-do checklist, SSO support, and shared folders. Cost: Free for individuals; $4.99/month/user for the Business version. Voxer adds push-to-talk functionality to smartphones. With the Business version, large corporate teams can communicate one-on-one or in groups in real time. The messages sent via Voxer are both live and recorded, as opposed to typical messaging apps where the message is packed, recorded, and then sent. The Voxer Admin Portal allows company heads or team leads to manage all Voxer users in the company, split users into teams, and even track, via geo-tagging, where messages are being sent from. Cost: The app is free. Pricing for the online tool starts at $15.95/month. Available on Android too? No, but an Android version is in the works. Smartsheet is an online project management/collaboration tool. With Smartsheet, you see an Excel-style interface that lets you invite collaborators, set controls, keep track of versions, set alarms, etc. The mobile app lets users access any project from an iPhone or iPad, and it keeps everything in sync and up to date. Working in conjunction with the Blue Jeans video conferencing service, the Blue Jeans app lets users join multi-party video calls from iPhones and iPads. The cloud-based Blue Jeans video conferencing service works with most existing video conferencing systems (Polycom, Cisco, LifeSize TelePresence, Microsoft Lync, Skype, Google Video Chat, Jabber, and even standard audio) to create a unified video conferencing platform that allows users to keep using whatever they're already comfortable with. With a 3G and Wi-Fi capable app, Blue Jeans app users can join video calls from practically anywhere. Cost: Pricing ranges from free for a basic version to $13.25/month for the Pro version. 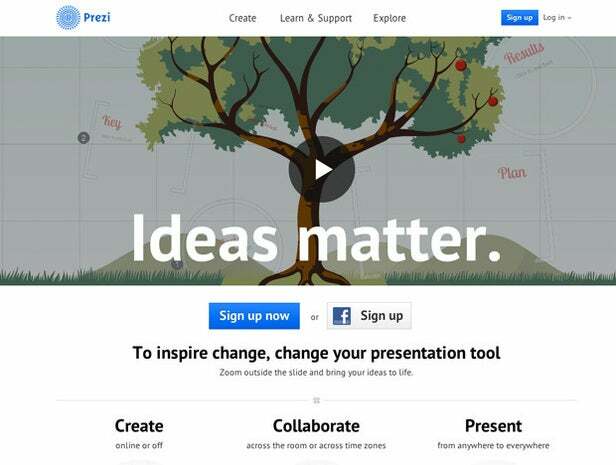 Prezi is a presentation platform that offers an alternative to PowerPoint. The Prezi secret sauce is its rethinking of how presentations are structured. Instead of creating a series of slides, with Prezi you put everything – text, graphics, charts, quotes – on a single canvas and trace a path, which zooms in and then back out, as you travel from one idea to another. What viewers experience is an animated tour of your concepts, rather than slides marching by one by one. Kashoo provides cloud-based accounting software, which includes mobile access through an iPad app. There are a million and one mobile accounting tools out there, but Kashoo actually offers double-entry accounting, which is what most bookkeepers, accountants, and, heaven forbid, the IRS prefer. In other words, Kashoo is more than simple recordkeeping and expense tracking. It's a full-blown accounting suite. Cost: Free for up to 25 passwords; $1 per month for more than 25. Do you struggle to keep track of all of those passwords you need to log in to webmail, social networks, bank accounts, various online subscriptions, etc? The more you need to remember, the more likely you are to either reuse them or rely on weak passwords. According to Deloitte, in 2013 more than 90% of user-generated passwords are vulnerable to hacking, even those considered strong by IT departments. If you create a weak password using PasswordBox, the app will warn you about it. PasswordBox stores your passwords, so you don't have to remember them or write them down. All you need to remember is one master password. Cost: The base plan is $59.99/year and covers five users. Additional users are $14.99/year. Pricing includes both unlimited devices and secure cloud storage for all users in the group. Keeper is another password manager for smartphones and tablets. The novel feature with keeper is that IT administrators and security professional are able to use Keeper for Groups to manage, backup and synchronize passwords for office teams and working groups. Of course, parents could use it to manage passwords for children, as well. PassionTag helps brands turn their most passionate followers into de facto brand ambassadors. PassionTag's "in-image digital marketing" platform lets users tag things they are passionate about through photos shared via Twitter, Facebook, e-mail, and SMS. With PassionTag, they can turn a static image into an interactive photo containing actionable tags that extend the story they want to tell. Of course, brands will want to monitor and tap into this. And brands can also create their own tagged photos or PassionTag-based campaigns, but the goal here is to create grassroots, authentic, word-of-mouth buzz.